The Green Coalition is a non-profit association of groups and individuals with a mandate to promote the conservation, protection and restoration of the environment and the wise use of green and blue spaces. You are cordially invited to the Green Coalition Annual General Meeting on May 2, 2019. After a brief business meeting there will be an update on the Legacy Fund for the Environment followed by presentations from representatives of our member groups. Members of the Green Coalition were saddened to learn of the passing of Lucia Kowaluk. Along with her founding role in the Milton Park housing co-op and her many other activities in the community, which were recognized by the award of both the Order of Québec and the Order of Canada, Lucia was always a strong supporter of the Green Coalition's efforts to preserve urban natural spaces. She will be sorely missed. Our sympathies to her colleagues, friends, and family. Several environmental organizations polled Montreal's municipal parties on where they stand on green issues and theyre making the answers public. There were eight questions in the survey that was given to candidates from all four political parties. The questions asked were, for example, if candidates would oppose development in Pierrefonds West or if they would protect the St-Jacques Escarpment or support the creation of Meadowbrook Park. You are cordially invited to the Green Coalition Annual General Meeting on May 4, 2017. After a brief business meeting there will be an update on the Legacy Project followed by presentations from representatives of our member groups. Febuary 8, 2017: Green Coalition News Release - Green Coalition expert reports uncover negligent environmental assessment process by Quebec Environment Ministry in the destruction of wetlands in the Saint-Laurent Technoparc. In September 2016 the Green Coalition requested a preliminary injunction to halt the ongoing work to extend boulevard Alfred Nobel and other intrusions into the wetlands then being carried out by the borough of Saint-Laurent to facilitate the development project known as the Èco-campus Hubert Reeves. The request was judged to be urgent but was not granted when, during the hearings, lawyers for the Ministère du dévelopment durable, de l’environnement et de la lutte contre les changements climatiques du Québec (MDDELCC) submitted a list of studies on which they had apparently based their decision to grant Certificates of Authorisation for the project. The Green Coalition subsequently commissioned analyses of these studies by two independent experts which identified major faults and irregularities in the studies, faults and irregularities that were never submitted to the first Judge by the MDDELCC. The expert reports clearly demonstrate that the Technoparc studies were exclusively conducted by and for the real estate promoter and were outdated, incomplete and totally inadequate to support the granting of the certificates. The Green Coalition strongly believes that 100% of Anse-à-l'Orme must be conserved in both Pierrefonds and Saint-Anne-de-Bellevue. This conviction stems from our absolute commitment to conserving and preserving natural spaces on the Island of Montreal, to conserve them for their inestimable ecological value and their importance to Montreal's citizens. Conservation of this kind is an environmental and political imperative since we are living through an era of immense environmental destruction. For the Green Coalition, saving the natural heritage of Saint-Anne-de-Bellevue North, its agricultural lands "en friche" and forests in the Le Corridor écoforestier de la rivière-à-l’Orme, has been a preoccupation since the 1980s, because the Corridor harbours the richest biodiversity in the Montreal Agglomeration. Green Coalition insists that a Grand-parc national be created to conserve the entire Anse-à-l’Orme Corridor and adjacent nature parks, east, west and north along Lac-des-Deux-Montagnes, and, that the Grand-parc become the keystone piece of the "Ceinture verte du Grand Montrèal". The City of Montreal’s executive committee officially referred the proposed 5,500-home development in Pierrefonds West to the Office de consultation publique de Montréal (OCPM) on Nov. 16, Pierrefonds-Roxboro Mayor Jim Beis confirmed at the borough council meeting Monday night. No date has been set for the start of the first, “upstream” public consultation period, expected to begin early in 2017. The entire consultative process, which will require a new, specific urban planning program and several rounds of consultations, could last until 2019. A year ago, I listened to Justin Trudeau talk about “sunny ways” Canada. I cautiously believed in a new, bright, reconciliatory moment for our country. August 13, 2016: Come to the Exhibition l’Anse à l’Orme launches the Alarm! 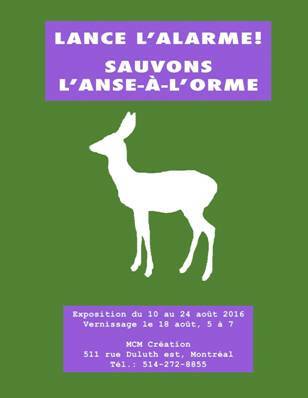 Sauvons l'Anse-à-l'Orme invites you to an exhibition of works by artists who oppose the destruction of the last natural spaces on the Island of Montreal! 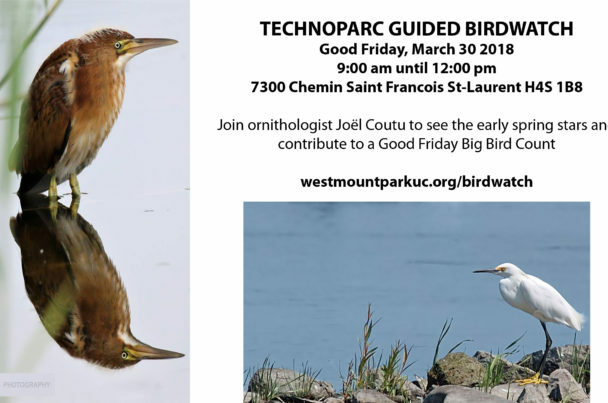 Bird lovers in the St-Laurent borough are calling on an industrial park to reconsider developing on wetlands they claim have some of the richest biodiversity on the Island of Montreal. Construction of the Éco Campus Hubert Reeves, an incubator for young cleantech firms, is set to start next month on a piece of undeveloped land just north of Trudeau airport. This would expand the current Technoparc Montreal, where companies like Bombardier, 3M and Hewlett Packard have offices. 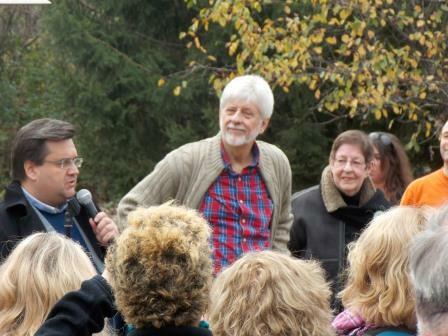 About 200 people rallied near Saint-Bruno to make another push to save a wooded area from a luxury housing development. The six-hectare forest, called Hirondelles Woods, is considered an important home for wildlife by environmentalists, and one of the few remaining spots for an endangered plant, the wild ginseng. Protesters want Quebec Environment Minister David Heurtel to nix the project, which would subdivide the forest — about the size of nine football fields — to build 30 luxury homes. May 5, 2016: Green Coalition Annual General Meeting. Just in time for International Earth Day on Friday, local environment groups are calling on Montreal Mayor Denis Coderre to make a real commitment to preserving the remaining natural green space on the island of Montreal. On Thursday, representatives of several local environment groups posted a Charter on Green Space Protection on the door of Montreal City Hall, demanding an immediate moratorium on development of green spaces on the island and recognizing every Montrealer’s right to live near accessible natural spaces. The charter is the fruit of a forum held last weekend which brought together about 100 people, including scientists and experts in biodiversity, green space protection, urban planning, health, social welfare, along with members of 40 local environmental organizations, including Canadian Parks and Wilderness Society (CPAWS), Les amis du Parc Meadowbrook, Sauvons L’Anse-à-l’Orme, GRAME, Sauvons la Falaise, the Green Coalition, and the Sierra Club Québec. For the Green Coalition, Feb. 23, 2016 is an historic day. Today, in David Suzuki Foundation made public the results of two important environmental studies that indicate that a real estate project must not be built on the wet meadows of Western Pierrefonds. First, there is the Report entitled Ecological Assessment of the Western Area of Pierrefonds Roxboro, prepared by Marie-Éve Roy, Patrick Gravel, and Jérôme Dupras. The report is an ecological inventory of wet meadows targeted as a site for a massive real estate project. The results of the report revealed that there are more than 270 species of flora and fauna present in the area, some of which have special status under both provincial and federal law, as well as rare and endangered species, and at least one that had been thought to have disappeared entirely from the island of Montreal. Secondly, another study by a group of experts in environment and land management indicates that a very large housing project in this area would increase the fragmentation of this eco-territory by 90% thereby negatively affecting the environmental connectivity and regional biodiversity. The head of scientific projects for the David Suzuki Foundation, Jean-Patrick Toussaint, draws a very clear conclusion: "In the light of these studies, it is obvious that a real estate project in this area must not be built. The Montreal Agglomeration and the borough of Pierrefonds-Roxboro must stop this project and Quebec and Ottawa must issue emergency orders under Quebec's law on endangered species and Ottawa's legislation on imperiled species, and certainly for the brown snake and the Canada black snakeroot. Community group Sauvons l’Anse-à-l’Orme presented a petition with 9,700 signatures to Pierrefonds-Roxboro borough Mayor Jim Beis on Feb. 1. The petition, presented by Sauvons spokesman Ross Stitt, calls for the protection of 100 per cent of a green space in Pierrefonds West now zoned for residential development. 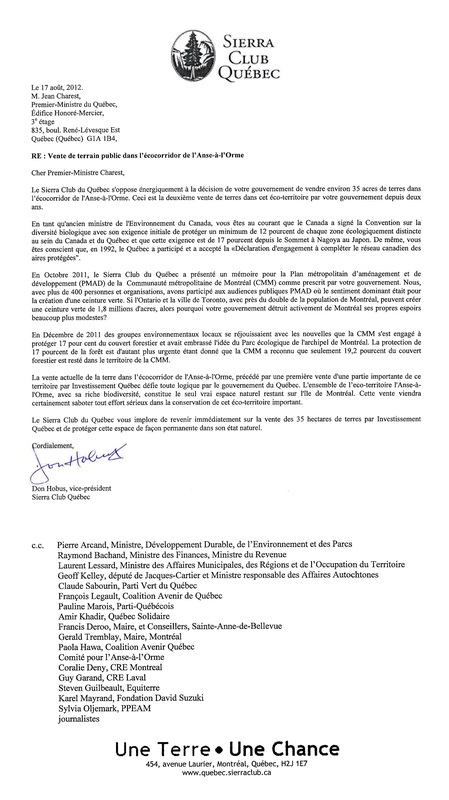 January 29, 2016: Citizen’s group submits petition signed by more than 9500 citizens demanding protection of 100% of l’Anse-à-l’Orme corridor. Parties to the U.N. Framework Convention on Climate Change (UNFCCC) reached a landmark agreement on December 12 in Paris, charting a fundamentally new course in the two-decade-old global climate effort. Culminating a four-year negotiating round, the new treaty ends the strict differentiation between developed and developing countries that characterized earlier efforts, replacing it with a common framework that commits all countries to put forward their best efforts and to strengthen them in the years ahead. 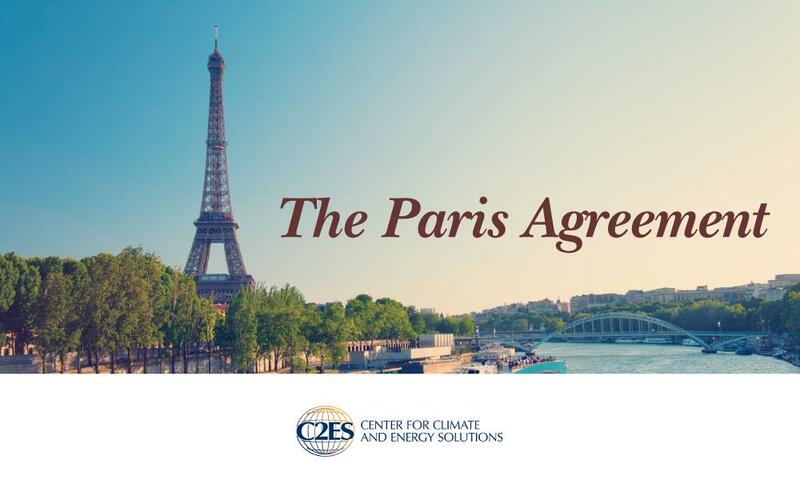 This includes, for the first time, requirements that all parties report regularly on their emissions and implementation efforts, and undergo international review. 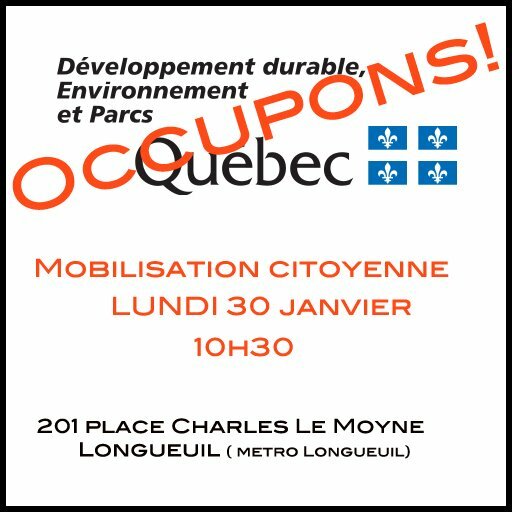 December 14, 2015: Sierra Club Quebec, GRIP-UQAM, the Green Coalition and several citizen groups demand a ten-year moratorium on all residential development in green spaces on the island of Montreal. Sierra Club Quebec, GRIP-UQAM, the Green Coalition Sauvons Anse-à-l‘orme, Sauvons la Falaise and les Amis du Parc Meadowbrook join forces to demand from the Montreal Agglomeration, from all municipalities on the island of Montreal and from the government of Québec a Green Moratorium. Such a moratorium requires a halt to all development on and in green spaces on the island of Montreal for the next ten years, the time needed to assure proper protection of natural spaces. Montréal, le 2 décembre 2015 - Mr. Réal Ménard, member of the Montréal Executive Committee responsible for sustainable development, the environment, large parks and green spaces, recommended to the urban agglomeration council the acquisition of a 22,999.4-square-metre piece of land in the Pierrefonds-Roxboro Borough, to expand the Rapides-du-Cheval-Blanc Nature Park. This piece of land is located on 5e Avenue Nord between boulevard Gouin and rivière des Prairies. The transaction is valued at $3,431,280, taxes included. 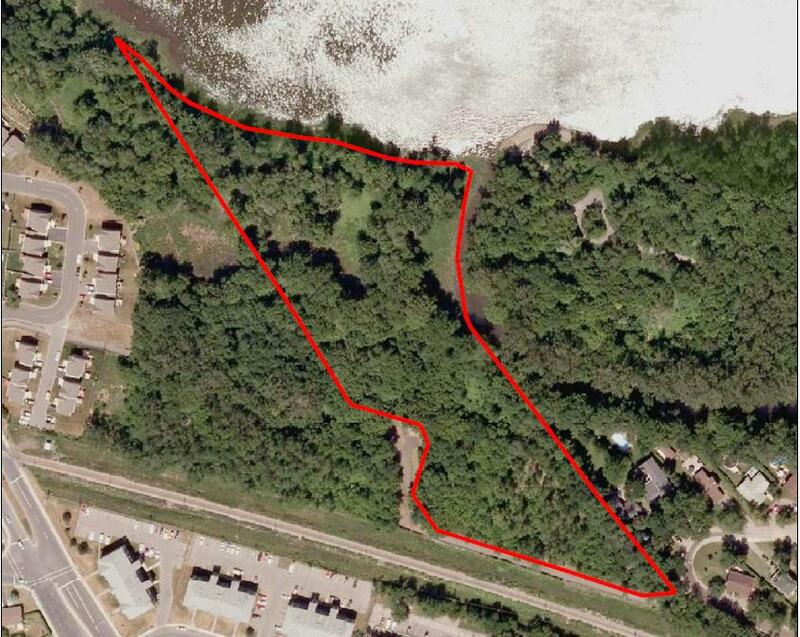 A 4-million-square-foot lot on Île-Bizard should be bought and added to the Bois-de-l’Île-Bizard Nature Park, the City of Montreal recommended to the agglomeration council on Nov. 19. The proposed purchase was also presented at Montreal’s city council on Monday. The lot, near Bord-du-Lac Road, would cost the agglomeration about $6 million. The purchase would still have to be finalized with the property’s current owner. The acquisition is part of the city’s goal to increase the amount of green space in Montreal. The recent Schéma d’aménagement et de développement, an urban planning document for the city adopted in January, set the target for protected natural areas to be 10 per cent of the city’s area. Inspired by Mayor Denis Coderre's jackhammer-versus-mailbox incident, residents and activists in Pierrefonds raised their pickaxes and jackhammers in protest against a planned housing development. The group Sauvons l'Anse-à-l'Orme claims a road in the l'Anse-à-l'Orme nature park is illegal and they want the city to halt any further development. "We're following mayor [Denis] Coderre's symbolic action of taking a jackhammer to mailboxes and doing the same thing to the road here," said Donald Hobus, a member of Sauvons l'Anse-à-l'Orme. "It's symbolic. We're not doing any damage but we're saying this road is illegal, we want it removed and want the whole area protected." The planned 185-hectare development would erect 5,000 new housing units. The group has collected more than 6,000 signatures for a petition to stop the project, and this week it filed a second injunction against the developer. It plans to present the petition to Coderre and the Pierrefonds-Roxboro borough mayor Dimitrios Beis next month. The group objects a plan to develop over 5,000 homes on the forest and wetlands near the l’Anse-à-l’Orme Nature Park.They insist the land is home to a variety of wildlife that would be devastated by the plan. 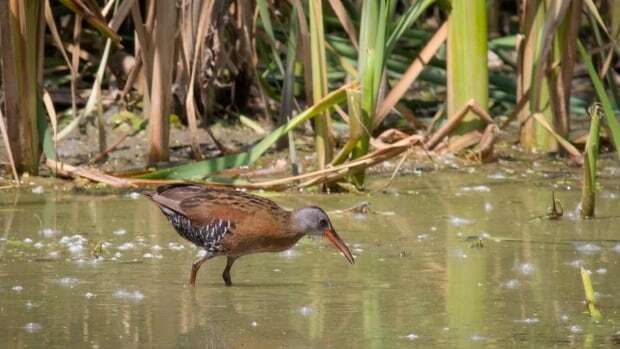 The City of Montreal will spend $3.5 million to acquire a 78,500-square metre expanse of land in the West Island and add it to the protected l'Anse-à-l'Orme nature park. The property at 575 Elm Avenue in Beaconsfield is part of the Angell Woods forest. The acquisition of the land – about the size of ten CFL football fields – would extend l'Anse-à-l'Orme nature park to Highway 20. Almost 2,000 have signed an online petition calling for the mayor of Montreal and the borough mayor of Pierrefonds-Roxboro to reconsider a planned 5,000-house development near the Anse-à-l’Orme eco-territory in Pierrefonds West. 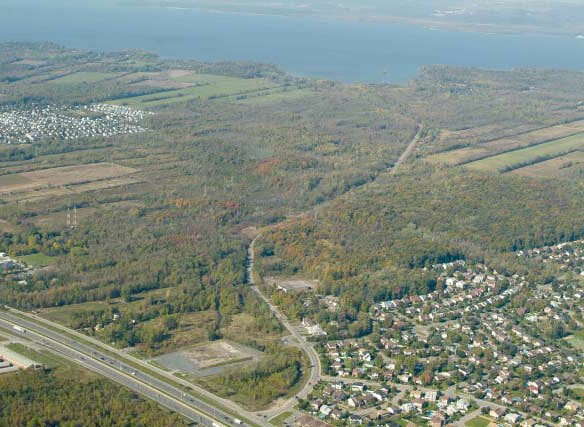 The petition, circulated by environmental group Sauvons-l’Anse-à-l’Orme, calls for the city and borough governments to protect 185 hectares currently designated for the development, noting that the ecosystem is vital to the area, and borough residents may also have to pay more in taxes to support services for the new development, including snow removal and garbage services. The city announced in June that 180 hectares would be set aside for conservation as part of the development plans, but critics said that the effort was nothing more than a new, environmentally-friendly label on an old plan that would exacerbate traffic issues and destroy an ecosystem that is “unique” on the island of Montreal..
We wrote earlier about the controversial 6,000-home residential project in Pierrefonds West that is strongly opposed by environmentalists. To understand their point of view, The Times did a nature walk there with David Fletcher, 75, a retired teacher who is extremely knowledgeable about local flora and fauna. This 185-hectare parcel was farmed until the 1980s, but now sits fallow. It is clear that 2015 will be the warmest year in the period of instrumental measurements, as an ongoing El Nino adds to a warming trend. We can already predict that the 2015 global temperature will exceed the prior warmest year (2014) by an unusually wide margin (~ 0.1°C), exceeding 1998 (“El Nino of the century”) even further. 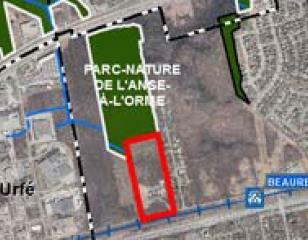 Save the 185 hectares targeted for a monster development at Anse-à-l’Orme in Pierrefonds West! A monster development is being planned – up to 6,000 housing units, some 16,000 new residents, adding 10,000 more cars to West Island ’s traffic gridlock. Instead of this unacceptable encroachment on the l’Anse-à-l’Orme Corridor, the Green Coalition and the Mouvement Ceinture Verte are appealing to the Coderre administration to conserve the 185 hectares of prime farmland “en friche” and to protect its outstanding habitat and biodiversity. For more information, see sample letter and Green Coaltion position below. Please write a letter, in your own words, to Mayor Denis Coderre and send a copy to Mr. Jim Beis, Mayor of Pierrefonds-Roxboro and to Mr. Russell Copeman, Ville de Montréal executive committee member for housing and urban planning. 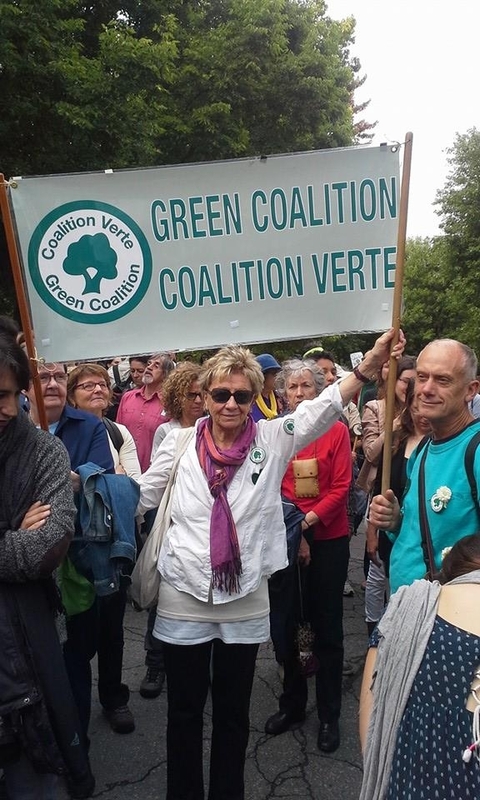 Also, please send a copy to the Green Coalition and to the Mouvement Ceinture Verte so that we can keep a record of the letters. Kindly circulate this message as widely as possible. 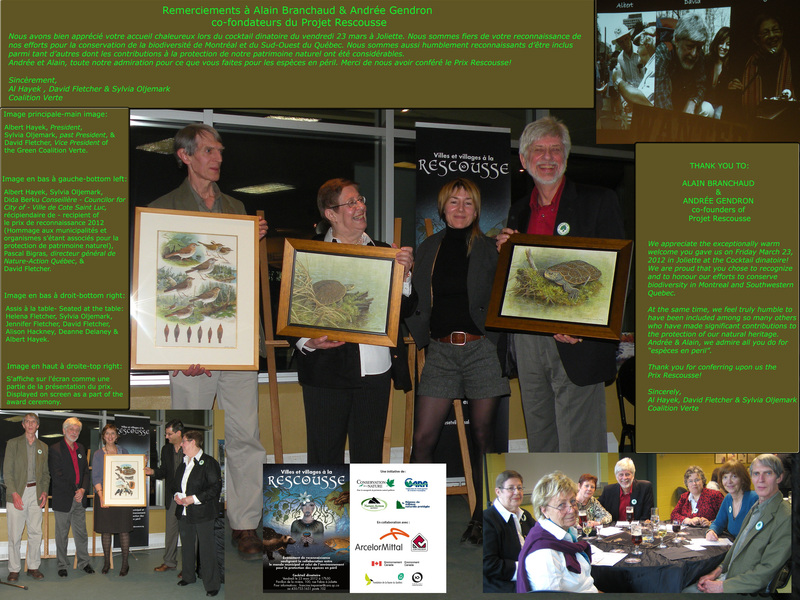 Thank you for helping to protect and conserve Montreal ’s natural heritage for our children and grandchildren. I appeal to you save the 185 hectares of prime farmland “en friche” at Anse-à-l’Orme in Pierrefonds West and to protect its sensitive habitat and biodiversity. Please do not carve a housing development into Anse-à-l’Orme Corridor. Anse-à-l’Orme Corridor is an asset of exceptional ecological and economic potential – unique among urban agglomerations – anywhere. Will you please protect Anse-à-l’Orme Corridor in its entirety for our Metropolis – including all 185 hectares in Pierrefonds West? You will bestow a living legacy in perpetuity on all Montrealers. Monsieur Russell Copeman, responsable de l'habitation, de l'urbanisme, des immeubles et stratégies immobilières au comité exécutif de la Ville de Montréal. June 12, 2015 Sauvons L'Anse À L'Orme! Green Coalition opposes the massive residential project in Western Pierrefonds. Between 5,000 and 6,000 new residences are slated for Western Pierrefonds on 185 hectares of prime farmland. This is largest housing project ever for Montreal. It would destroy prime farmland “en friche” and, the largest remaining swath of unprotected natural green space in the agglomeration of Montreal. Such natural green spaces must be protected for the benefit of all Montrealers! It’s the right thing to do. SCHÉMA: The agglomeration’s newly-adopted Schéma d’aménagement boosts the target for protected green space to a minimum of 10%. The new target requires the conservation of roughly double the amount of land protected to date – the equivalent of 12 ½ Mont Royal Parcs or 25 Angell Woods. 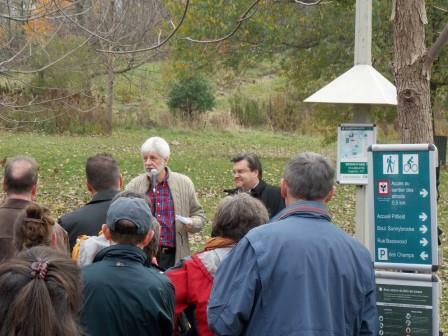 The conservation of Western Pierrefonds’ 185 hectares is primordial to help attain the target. Note: there will be slightly less to achieve once properties “en voie d’être protégées” are secure, about .7% of the territory. PMAD: The Plan métropolitain d’aménagement et de développement espouses the protection of agricultural land in the Communauté métropolitaine de Montréal (CMM). 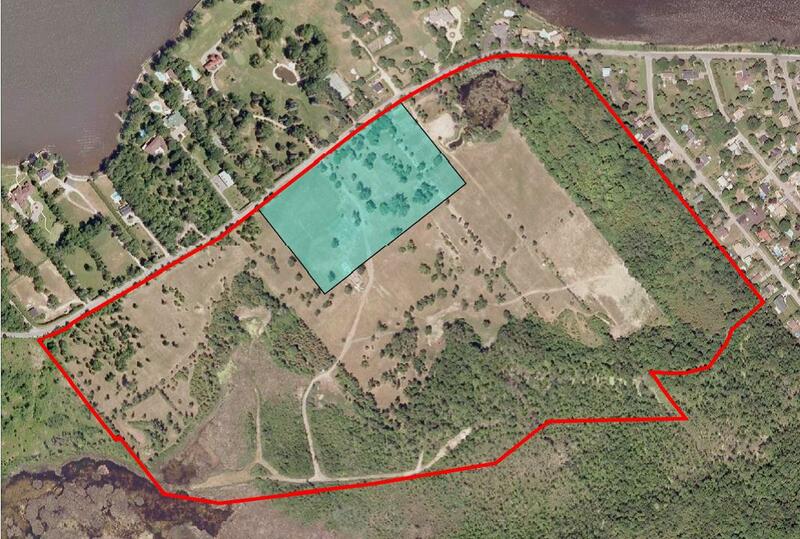 The loss of prime farmland is an error whether it occurs on Montreal Island or off-island. The best agricultural lands in Quebec:The Pierrefonds farmlands have excellent soil quality and the longest growing season in the region, due to Montreal Island’s unique micro-climate created by its surrounding river systems. These on-Island farmlands are the best agricultural lands in all of Quebec. They have the capacity to produce “bumper harvests”. Sustainable Development: Montreal prides itself on being a Sustainable Development city; Montreal must not sacrifice its Pierrefonds farmland, a non-renewable resource, nor lose forever its potential as a food source, to residential development. Agricultural land with the potential to be worked within city boundaries, and close to produce consumers, is the epitome of sustainable practice. Sustainability is about reducing environmental footprint within the particular, relevant jurisdictional, economic and social context; about meeting needs, including contact with nature, from within to the greatest extent possible. Habitat loss and many species at risk: These farmlands “en friche” are ecologically important in their own right. With patches of regenerated woodlands, marshes and stream courses, they provide essential and exceptional habitat for nesting birds and other wildlife. Many are endangered. For example, the Bobolink, still present in Pierrefonds, is in drastic decline worldwide because its sole habitat, fields “en friche” are being lost to residential development. Heat-Island effect: Natural greenspace mitigates the effects of urban pollution on air, soil and water and provides recreational potential for the physical and mental well-being of urban residents. 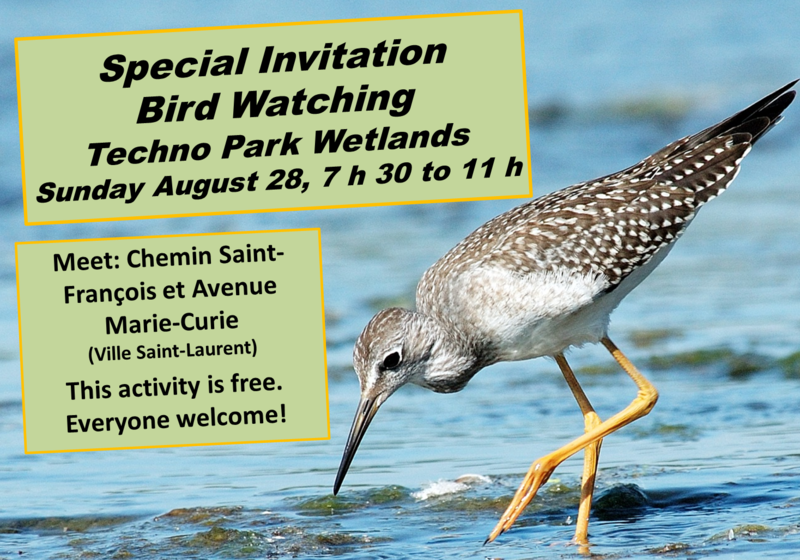 Such health-giving benefits of the 185 hectares in Western Pierrefonds, the largest remaining swath of unprotected natural green space in the agglomeration, are slated to be replaced by concrete and asphalt. A substantial Heat-Island will result. Quasi-flood plain inappropriate for residential development: The exceptionally high water-table throughout the farmlands “en friche”, especially in springtime, means that new homes in Western Pierrefonds will be subject to flooded basements and unsanitary mold problems. Similar high water-table phenomena prevail in Saint-Anne-de-Bellevue North. New home-owners there already have flooding problems. Le corridor écoforestier de la rivière à l’Orme:Pierrefonds’ agricultural land forms an integral component of the Le corridor écoforestier de la rivière à l’Orme. From Angell Woods in the south to Lake of Two Mountains in the north, this heritage conservation area boasts exceptional forest ecosystems, wetlands teeming with wildlife, incomparable biodiversity and Montreal’s only inland river system. The ongoing work to conserve this remarkable eco-corridor in the heart of the Metropolitan region is an outstanding achievement. The agricultural zone* in Pierrefonds must be included. *De-zoning the “permanent”agricultural zone:In 1991, despite the massive majority opposition mobilized by Green Coalition at the public hearings, 700 hectares of prime farmland were deleted from the permanent agricultural zone in Senneville, Sainte-Anne-de-Bellevue, Île-Bizard and Pierrefonds. After 1991, Pierrefonds farmlands were designated RURAL until that designation was quietly changed to RESIDENTIAL in 2009. Up to 6,000 housing units – as many as 16,200 new residents are projected for the Pierrefonds West development in Anse-à-l’Orme. The norm in Pierrefonds is 2.7 occupants per residence. This population increase of as many as 16,200 new residents would place an intolerable additional burden on services and infrastructures in West Island. Approximately 10,000 additional cars would be squeezed onto roads already impossibly choked with traffic. Congestion is unmanageable now; off-Island traffic exacerbates the problem: Arterial congestion is already in an unmanageable state and it will be even more intractable as the Vaudreuil-Soulanges MRC west of the Île aux Tourtes bridge undergoes its next projected population surge. Over the last several federal censuses, this region of the Suroît has been one of the fastest growing residential populations anywhere in CANADA! More West Island development is untenable: There are only two routes on and off the west end of the Island, the major one being the A-40 at the Île aux Tourtes bridge, the lesser being the Highway 20 crossing at the Pont Galipeault. No other options are feasible given the broad expanses of Lake of Two Mountains and Lac St-Louis. This unique situation among Canada’s large conurbations militates against further West Island development. Public transit options are nonexistent: The Pierrefonds West development cannot be a TOD:Western Pierrefonds has no practical public transit options that serve existing residents in the sector, let alone adding up to 16,200 new ones to the overload. Train de l’Ouest will provide public transit options, mostly for West Island’s Lakeshore population. Once that service is extended to the Suroît, those looking for new homes will likely opt for new developments off-island. Home buyers will take note that, for the morning commute, those boarding trains closest to the western terminus will have the best choice of seats while commuters on-Island will be standees for the entire trip downtown, much like the situation on the Agence métropolitaine de Montréal’s (AMT’s) Two Mountains Line. As an added attraction, it is off-island that house prices will be more competitive and conditions will be less crowded, with more accessible green space. Many former West Islanders have made this choice. Train de l’Ouest will serve the West Island’s Lakeshore population better than the North Shore: 80,000 people reside south of the Trans-Canada Hwy or A-40, which roughly bisects the West Island, while over 130,000 live north of it. The northern sector is served dismally by existing rail service since the Two Mountains Line exits the Island before reaching very far into the midst of this majority population. The fact that train ridership is projected to burgeon in the near future and that trains will enter the Island already fully laden will be a further deterrent to a new commuter population in Western Pierrefonds that would have to travel south and west and cross the A-40 in order to access a station in Baie D’Urfe, 6.4 km (3.95 miles) away. Urban planners also offered an alternate proposal: express buses could ferry Pierrefonds residents to the nearest Two Mountains Train Line station in Roxboro, an average distance of 10.3 kilometers (or 6.4 miles) away, AS THE CROW FLIES. City administrators claim the goal of the massive development in Pierrefonds West is to keep residents on the Island:The opposite may be the result. The Green Coalition is delighted that you and your administration have entrenched the protection of both Meadowbrook and Angell Woods in the new Schéma – the Land Use and Development Plan for the Agglomeration of Montreal. Citizens have sought to save these two iconic green spaces for more than a quarter-century. How exciting that these special places will now be protected for all Montrealers today and tomorrow. The Green Coalition is equally delighted that the Schéma will provide a significant boost for the protection of Montreal Island’s natural heritage to 10% of the territory. Your administration has taken up a brave and bold challenge: a good place to start is Western Pierrefonds. The Coalition strongly recommends that the 175 hectares there, slated for a massive residential development, be re-dedicated for conservation. Not only is this the largest remaining swath of unprotected natural green space in the agglomeration, but it is also prime farmland. These farmlands have excellent soil quality and the longest growing season in the region, due to Montreal Island’s unique micro-climate created by its surrounding river systems. These are simply the best agricultural lands in all of Quebec. For our sustainable development city, it is imperative to seize the opportunity to save its Pierrefonds farmland, a non-renewable resource with outstanding potential as a food source, while helping to attain the new 10% target. Mayor Coderre, please accept our hearty congratulations on all your new initiatives for the protection and conservation of the natural spaces of our Metropolis. We look forward to more opportunities to continue our dialogue with you on these vital matters. The revised plan includes an increase in the terrestial natural space protection target from 6% to 10% and 'Green Space or Recreational' zoning for all of the Meadowbrook golf course. As Canadians we pride ourselves on transparency, accountablility and compassion-values that Stephen Harper campaigned on when running for prime minister in 2006. And yet, the actions of the Canadan government this week at the United Nations Climate Change negotiations in Peru represent the most shocking shift in Canada's values since this goverment took office. 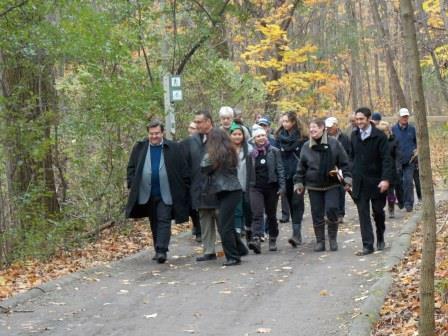 Mayor Denis Coderre took a hike Saturday through the hardwood forest of the Bois-de-Liesse Nature Park, a breathtakingly beautiful woods that would have been mowed down in the late 1980's if not for the hard work of some of his tour guides. 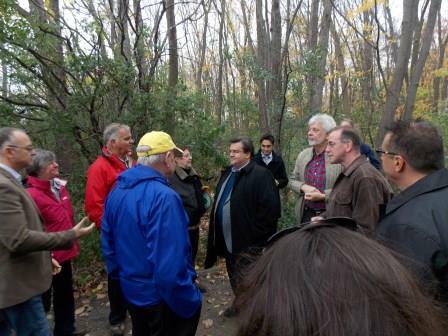 A group of about 100 Green Coalition members accompanied Coderre on the hike along a wide gravel path, now carpeted with golden leaves, that undulates through the towering trees.The afteroon was cool and overcast, but that had not discouraged the hike participants, nor dozens of runners, cyclists, and hikers - many pushing strollers - from flocking to this popular park. BOIS-FRANC FOREST IN BOIS-DE-LIESSE NATURE-PARK ! Celebrate Montreal’s natural heritage with the Green Coalition & help save our last green spaces. Join the invited dignitaries & citizens – walk the forest path through the enchanting Bois-Franc. PLEASE BE PRESENT OCTOBER 25 - RAIN OR SHINE! Help make the Green Coalition’s dramatic proposals for 2017 a reality. Geography marks all major cities in the world, especially those at the edge of great rivers. Think of New York City, seen by a visitor who approaches over the George Washington Bridge spanning the Hudson River. The green and brown bluffs of the Palisades in New Jersey, across from Manhattan’s busy streets, almost seem to gesture to the city just over the river. But more than a century ago, quarrying companies were so anxious to mine the Palisades that a public commission was needed to save the magnificent cliffs by creating a permanent park system.There’s a lesson here for us in Montreal: In order to preserve its environmental “signature,” a city needs to consciously recognize and value its own natural features. You are cordially invited to the Green Coalition Annual General Meeting on May 8, 2014. Presentations from member groups will be heard, and an update of the Parc Écologique de l’Archipel de Montréal project will be included. A brief business meeting will follow. WE NEED OUR MEMBERS TO COME OUT IN GREAT NUMBERS ON SEPTEMBER 24, AT 7:30 PM, TO MAKE YOUR VOICES HEARD. This note is further to our messages to you of August 24 and September 5, in response to the sudden August “rollout” by Beaconsfield City Council of an urban plan to develop Angell Woods. Our community has been given one month to digest this plan in anticipation of its planned approval by Council on October 1. Over 150 concerned citizens showed up for the September 9 information session on the plan. Most expressed general unease with the process and the plan. The Mayor himself is opposed. While the documentation is complicated, the City itself acknowledged that the plan commits to close to 500 condos in Angell Woods. 500 condos means at least 1000 additional cars. Citizens were told to focus on the glossy SPP overview document while at the same time being advised that the really important detail is in the actual zoning amendment by-laws. These by-laws were not tabled at the meeting and are in an apparent state of flux that is not being shared with the public. The results of the traffic study of the Woodland Exchange that the City commissioned in June are not being disclosed. Council is meeting on September 23 to approve for immediate construction Phase I of the development plan, being 68 condos on the wooded Sunrise north lot. No other details have been provided and no public input has been sought. The day after the approval of Phase I, Council is holding a formal public consultation, as required by law, on the balance of the Angell Woods plan. WE NEED OUR MEMBERS TO COME OUT IN GREAT NUMBERS ON SEPTEMBER 24, AT 7:30 PM ,TO MAKE YOUR VOICES HEARD. The meeting is again at Beaconsfield City Hall , 303 Beaconsfield Boulevard . PLEASE COME EARLY TO MAKE SURE YOU GET A SEAT! 1. No Prior Public Consultation – The City has stated that their plan is a direct result of its prior public consultation on Angell Woods. This assertion is not accurate. 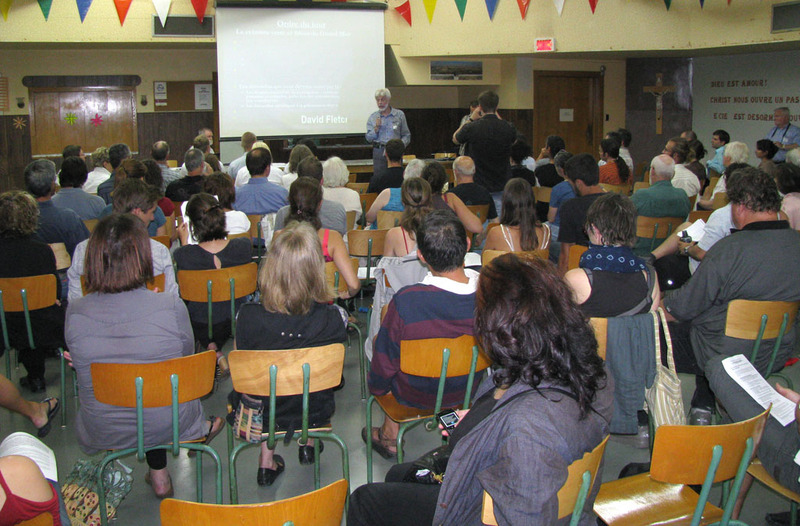 In 2011, three “Discussion (not consultation) Meetings” were held with people and groups hand-picked by the City. Beaconsfield also issued a general call for input from the citizens. The citizens responded with over 150 letters, ALL of which called for the protection of Angell Woods as a whole. APAW has copies of the letters. The City has never provided minutes of the Discussion Group meetings. Our APAW representative who was present at the meetings as a citizen took detailed notes, which have been placed on our website. http://www.apaw.ca There is absolutely no mention of a consensus of any sort on the part of the citizens for a “condos now, conservation later” solution for Angell Woods. 2. Running out of Runway – Council has had 3 years to consult with its citizens and propose a reasonable Angell Woods solution. Because the citizens were first advised of the plan at a regular Council meeting in August, many people in Beaconsfield are still not even aware of it. There is no mention of this major initiative in Beaconsfield ’s Contact magazine. The relevant documents were simply posted on the City’s website on August 21. The formal public consultation on these documents will be on September 24. Those citizens who are aware of what is going on will in good faith present their initial views and suggestions, after having had one month to review the plan. There will undoubtedly be other submissions and follow up questions after the September 24 meeting. Citizens and Councillors learn and get new ideas from listening to each other and reflecting calmly on what others have said. It completely unrealistic and highly irresponsible to think that the citizen input may be meaningfully integrated into a final plan between September 24 and October 1, which is the last day where the Council is legally permitted to meet to pass this plan. This current Council has run out of time. They should gather the initial comments and input from the citizens on September 24 and following and provide the whole package to the incoming Council after the municipal elections, for them to deal with it. This Council should not pass a plan that is still a work in progress. 4. Who Killed the Montreal Conservation Buyout? 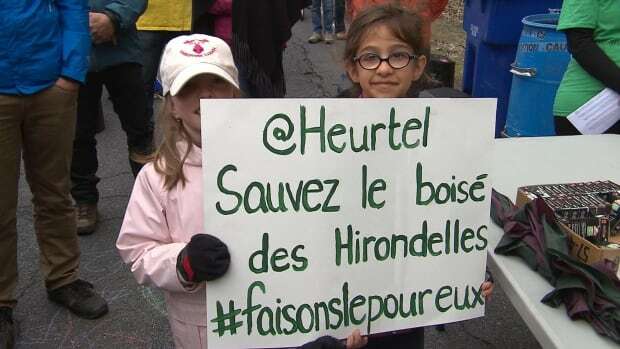 – Through the mainstream mediahttp://www.ledevoir.com/politique/montreal/387749/feu-vert-controverse-a-un-projet-immobilier-dans-un-boise-de-beaconsfield we have all learned that Montreal is not happy with the current Beaconsfield Council and administration. An Angell Woods conservation plan was being implemented by Montreal and the formal buy-out process was underway. Moneys from the provincial and regional conservation funds are available for this purpose. We were that close. 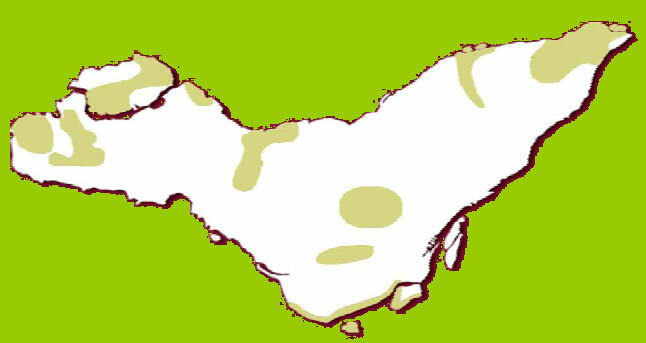 Beaconsfield Council killed this process by advising the land-owners in early July that a Beaconsfield development plan would be tabled on August 19. The land-owners of course refused the City of Montreal offer, anticipating a better deal with the Beaconsfield rezoning. Now the City of Montreal is reluctant to proceed, for understandable reasons. We need to re-establish trust in Beaconsfield and get this process back on the rails. THAT is the Angell Woods solution. 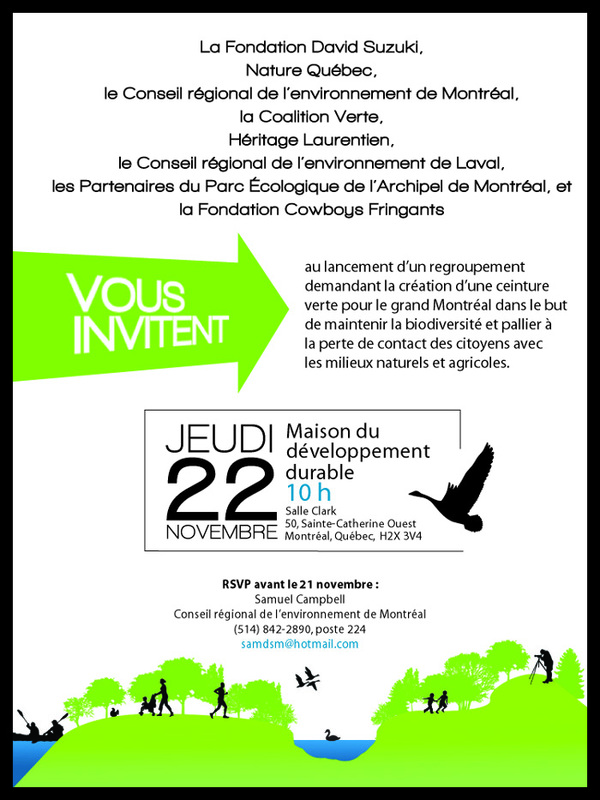 The Partenaires du Parc Écologique de l’Archipel de Montréal (PPÉAM) and the Green Coalition want to invite you to a very important meeting. Like you – and many others – we participated in the public consultations of the Plan métropolitain d’aménagement et de développement (PMAD) in 2011. We all demanded that the Greater Montreal Region have a Greenbelt . There were nearly 400 groups who filed briefs at that time, and all those carefully prepared position papers must not be disregarded and forgotten! People need to know the truth. In the Greater Montreal region we face a crisis. Despite all the promises of the PMAD, our natural spaces and agricultural lands are more threatened than ever. That is why the PPÉAM and the Green Coalition would like you to attend this public discussion, prior to the 2013 municipal elections, of the vital environmental questions facing our community. The City of Beaconsfield is presenting to the public its Urban Plan for Angell Woods on Monday, September 9 at 7 p.m. at the Beaconsfield City Hall , 303 Beaconsfield Boulevard . The plan provides for some undefined, future conservation initiatives, but commits the City to the immediate development of over 400 condo units. This plan is due to be approved in two phases: 68 condo units at the Council meeting on September 23 and the balance of the 400+ units at the Council meeting on October 1, being the last public meeting before the municipal elections. A public consultation will be held on September 24th. We need our APAW members to get out and voice their opposition to this development plan. The current elected Council has no mandate to implement the development of Angell Woods. This is more properly an election issue! There are other options available to Council: Angell Woods is eligible for provincial Fonds Vert acquisition support, and negotiations are still ongoing to purchase the site as a conservation park for the public. Why the rush to get a development plan through, and get 400 + condos built first? To help you, we have posted a critique of the City’s plan on our website www.apaw.ca. 5. the “carveout” of the Sunrise north woods from the urban plan is an urban planning manoeuvre designed only to circumvent public consultation and accelerate construction this fall of the first 68 condos. The Green Coalition, representing more than fifty grassroots organizations, seeks your immediate assistance. The tiny village of Saraguay is in turmoil. The tranquil old village on the shore of Rivière des prairies, is sheltered between two nature Parks , Bois de Saraguay and Bois de Liesse. Here, thirty-six years ago, citizens struggled to save the iconic Bois de Saraguay that was targeted for a massive development project. The campaign in the village, led by a founding group of the Green Coalition, was successful. Ultimately, Bois de Saraguay became a nature-park, and, it is the only nature-park to be designated by statute as an Arrondissement naturel under the aegis of the Cultural Affairs Ministry, where no trees may be cut down. Now, citizens are shocked that once more the Bois de Saraguay is at risk, and that, this time, so is Bois de Liesse. Thousands of trees could be cut down in Bois de Liesse and Bois de Saraguay nature-parks. A Hydro Québec servitude, with tall pylons carrying high-tension transmission lines traverses both nature-parks. 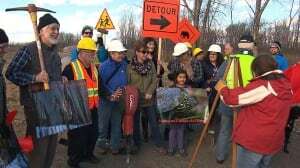 Residents are learning by word of mouth that Hydro Québec crews are poised to move their heavy machinery into the two nature-parks and that thousands of trees could be cut down along the servitude. Residents are protesting that the high-tension wires are many meters above the highest trees. Many majestic trees reached their maximum growth years ago: they do not interfere in any way with the high tension wires. The pylons and wires have been in place for decades without incident. What has happened to the Public Meeting promised by Hydro Québec? The citizens’outcry has alerted our elected representatives: the cutting operation has been halted temporarily. Hydro Québec has badly bungled its public relations in Saraguay. Hydro officials have permitted only a trickle of information to reach a few residents. The true magnitude of the cutting operations in the two nature-parks is still unavailable to the public. A public meeting for citizens with Hydro Québec is needed in Saraguay: Hydro Québec must provide information with full disclosure and utmost transparency. Citizens must be allowed to comment in this public forum. Two weeks ago Hydro Québec promised such a meeting, but now appears to be reneging on the commitment. Public awareness and respect for natural living environments has exploded. The public will to protect and enhance our natural green spaces has evolved over the last few decades: this is reflected in new laws, practices and policies. Citizens have been deeply involved in establishing these protocols, such as: The Migratory Bird Act; Programme d’acquisition et d’aménagement des espaces verts - communauté urbaine de Montréal; Politique de protection et de mise en valeur des milieux naturels - Montréal; PMAD - Plan métropolitain d’aménagement et de développement; la Loi sur le développement durable.Hydro Québec disregards such environmental laws, practices and policies. Hydro Québec acts unilaterally. When questioned, Hydro Québec treats citizens and elected representatives with a certain disdain. Hydro Québec needs a new regime for the twenty-first century compatible with new public attitudes and protocols: its “comportement” in dealing with the public needs a complete overhaul as well as its operational practices, particularly in densely populated urban areas. The “coupe à blanc” d’Hydro Québec, as routinely practiced at Anse à l’Orme from east to west across that ecoterritory, without regard for the exceptional ecological quality of its forests and fauna, is no longer acceptable in nature-parks and ecoterritories. This is just one example of this widespread practice. Madame Ouellet, with respect, the Green Coalition calls upon you to ensure that the public citizens’ meeting promised by Hydro Québec takes place in Saraguay. Citizens here deserve full disclosure from Hydro Québec: they fear the massive loss of trees will compromise the historical and unique “caractère champêtre et villageois” of their neighbourhood; they must have an opportunity to voice such concerns and to be heard. The timing for the meeting is important. To be equitable, it must be held at the end of August or early September after the holiday period. Forest going down? What irony! Contrary to city policy: Losing this forest flies in the face of the island-wide agglomeration tree policy, the “Politique de l’Arbre” that calls for the urban forest canopy to be augmented – not diminished. More irony: Mayor Edward Janiszewski of Dollard-des-Ormeaux and Councillor Christian Dubois of Pierrefonds/Roxboro were prominent members of the CMM Commission that heard the presentation of an unprecedented number of briefs, almost 400 of them, at the PMAD consultations in 2011. The vast majority of participants demanded the protection of the CMM’s last natural spaces and agricultural lands in urban and periurban milieux and they demanded these green spaces be linked together in a greenbelt network for Greater Montreal and Southwestern Quebec. They demanded a greenbelt like those of other world-class cities, such as Toronto , Vancouver , London and Berlin . Toronto ’s Greenbelt , at almost 2 million acres, is now the largest in the world! Green Coalition is proud to have mobilized citizen participation at those hearings. Green Coalition stands ready to help and support its member group in defense of the Roxboro/DDO forest – Le comité pour un environnement sain à Dollard des Ormeaux Roxboro (CESDDOR). You are cordially invited to the Green Coalition Annual General Meeting on May 10, 2012. "Strategies for urban greenspace conservation: is the PMAD a game-changer?" We appreciate the exceptionally warm welcome you gave us on Friday, March 23, 2012 in Joliette at the Cocktail dinatoire! We are proud that you chose to recognize and to honour our efforts to conserve biodiversity in Montreal and Southwestern Quebec . At the same time, we feel truly humble to have been included among so many others who have made significant contributions to the protection of our natural heritage. Andrée & Alain, we admire all you do for “espèces en peril”. Thank you for conferring upon us the Prix Rescousse ! You are demanding a greenbelt for Montreal. The Montréal Metropolitan Community responds! You attended the PMAD consultations in record numbers! This was the greatest outpouring of opinion ever expressed at such public hearings. The CMM had to double the number of consultation sessions to accommodate the groups and individual citizens that registered to be heard – almost 400 briefs were deposited. Certainly, you made cogent and compelling arguments for the protection of the CMM’s last natural green and blue spaces, demanding the creation of a greenbelt of forests and floodplains, agricultural lands, wetlands and islands linked together by green corridors and streams, and the great rivers of south-western Québec - the Parc Écologique de l’Archipel de Montréal ! Expectations are high for a positive response from the CMM on Thursday. Please be present. Numbers count! The public consultation process on the PMAD - Le Plan métropolitain d’aménagement et de développement de la Communauté métropolitaine de Montréal –has begun ! Defend your natural heritage, speak out strongly. You are demanding a greenbelt of forests and floodplains, agricultural lands, wetlands and islands linked together by green corridors and streams, and the great rivers of Southwestern Québec (‘le Québec méridional’). La procédure pour les consultations publiques sur le PMAD débute le 2 septembre. the protected wetlands near the Cheval Blanc Rapids shoreline in Pierrefonds. Our river defines us, a constant in the history of our island city. But today, its diverse and sustaining wetlands are endangered, writes Donna Nebenzahl in the third of a three-part series. Pimento 24: Nature Walk through Woods#3 with David Fletcher. January 25th, 2010. Members from the Green Coalition at the City of Montreal Council meeting during question period. Mayor of Beaconsfield David Pollock speaksabout the Natural Spaces issue. and the allocation of new funds. regarding the natuarl spaces program and the allocation of new funds. Thank you for the comments that you sent to the Mayor of Montréal concerning the funds earmarked for the Politique de préservation et de mise en valeur des milieux naturels. If you examine the Ville de Montréal’s 2010 budget tabled at the municipal council meeting on January 13, 2010, you will see that not only are we not cutting budgets in this realm but are complying fully with our policy by adding $36 million over the next three years. What is more, this decision was very well received by agencies devoted to environmental protection. I appreciate your interest in the administration of our city and your commitment to protecting the environment. Your presence and support is needed at the Public Question Period of the Budget Meeting of Montreal City Council | Monday Jan. 25 th 9:30 a.m. Registration to ask questions begins at 9 a.m. Montreal City Hall West end entrance. “ $12 million a year over the next three years for the acquisition of natural spaces on the island of Montreal. " To be sure these funds are available, they must be earmarked for the Politique de protection et de mise en valeur des milieux naturels and included specifically in the Budget to be adopted by the City Council and the Agglomeration Council. The Agglomeration meeting will take place on Tuesday Jan. 27 th at 7 p.m. and your attendance at both meetings is greatly appreciated. Green Coalition members were on hand at the first post-election agglomeration council question period on December 3. They were stunned by responses from Mayor Gérald Tremblay and newly appointed vice-chairman, Alan DeSousa of the city’s powerful executive committee. Citing budget constraints, they both sent signals that the city’s natural spaces program, the Politique de protection et de mise en valeur des milieux naturels, is on the ropes. New money for the natural spaces program drying up: During the election campaign a commitment was made that $36 million in new money would be dedicated to acquisition/protection of natural spaces over the next 3 years…with only a modest part of this sum for park facilities. Instead, it was made clear at the question period that these priorities have been shifted; now the lions’ share of $41 million ($36 million +$5 million unspent from last year’s greenspace budget) will be assigned to improvements in existing local and 'grands parcs’. Evidently there will only be financial crumbs for new conservation. Adoption/implementation of the Recommendations of Agglo Commission uncertain: Following well-attended public hearings on the natural spaces progress report or Bilan, the Commission tabled positive recommendations last June, including that Meadowbrook become the 11th ecoterritory. But with no debate, no official comment, rejection or acceptance or modification – in short, no due process, input from Montrealers is being swept aside. Defunct: The lack of funding, coupled with official waffling on the Commission’s recommendations signals that the Politique de protection et de mise en valeur des milieux naturels is defunct. Defunct, unless city leaders change course because right now the city’s structured conservation program is being reduced to ad hoc decision-making. Mr. De Sousa stated that the city could decide to acquire some natural areas “as opportunities arise”. More than 1,000 unprotected hectares of natural greenspace across the Island are now more at risk than ever of being hacked down and replaced by asphalt and concrete. Slim Pickins: Strategically important natural areas have been protected since the Politique de protection et de mise en valeur des milieux naturels was adopted in 2004. Adding onto the 1614 hectares or 3.2% of the Island territory protected by the Montreal Urban Community prior to 1992, the city claimed it had reached 5% in its May 2009 Bilan. The city gave 'protective status' to 427 hectares in existing parks – but in parks that had already been protected for decades. Really new conservation in the ecoterritories since 2004 is only 285 hectares, less than 1% of the Island. (1% = 500 hectares). Even with a flurry of pre-election acquisitions, the total of new acquisitions remains below 1%. Mayor Tremblay’s and Montreal’s international credibility are at stake: The mayor is doing important work on the World Stage to promote biodiversity conservation around the planet – never more important than in 2010 – The International Year of Biodiversity (IYB). But the mayor’s credentials can only be validated by conservation here at home. World cities are ramping up their conservation efforts for IYB. To maintain our international leadership, Montreal’s mayor must do no less. Green Coalition calls on Gérald Tremblay to stay the course and not to retreat from the Politique de protection et de mise en valeur des milieux naturels. A member of the Green Coalition's Board of Directors, Patrick Barnard, has posted a video, Pimento #16. It includes a serious appeal on behalf of the Green Coalition, asking the City of Montreal to stick to its Natural Spaces Policy and the City's promise to budget it properly. You can help - ask for new money - $41 million over the next 3 years for the Natural Spaces Program! 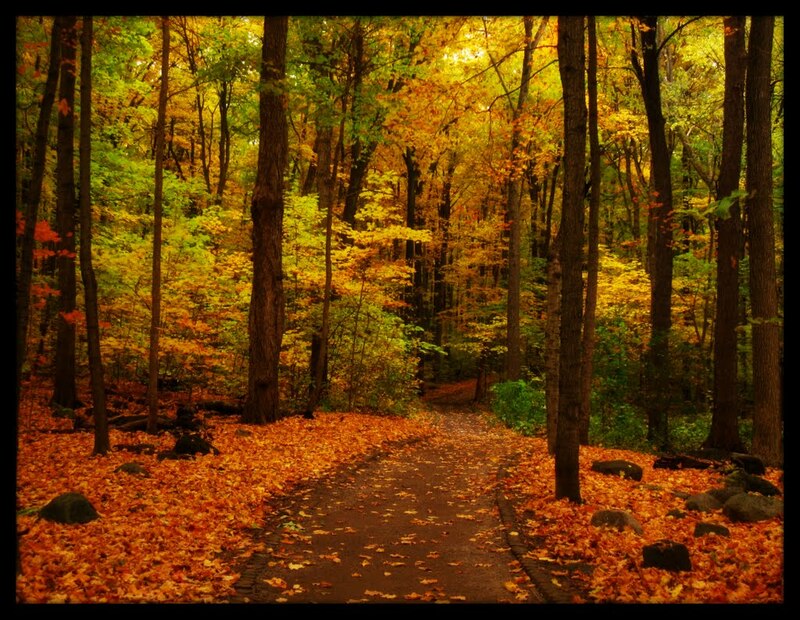 You can help save Montreal's last natural spaces! Please circulate this appeal to all your contacts! Une soixantaine d'organismes se sont regroupés en partenariat pour créer le Parc Écologique de l’Archipel de Montréal. Le but de cette démarche collective est de sauvegarder au minimum 12 % du domaine bioclimatique original de l’érablière à caryer du sud-ouest du Québec. Ce patrimoine naturel est menacé de disparition, alors qu’il recèle la plus grande biodiversité au Québec. Le projet de parc vise ce vaste domaine écologique dont la superficie s’étend des Basses-Laurentides jusqu'à la frontière américaine et du Sûroit à Sorel. Ce projet d’envergure s'agit de créer une ceinture verte pour Montréal et le sud-ouest du Québec - une ceinture verte de forêts, de milieux humides, de plaines inondables et d'îles, tous reliés par les corridors verts, les ruisseaux et les grandes rivières qui sillonnent le Québec méridional. *New* Audio of the presentation given at the Commission permanente du conseil d'agglomération sur les grands équipements et activités d'intérêt d'agglomération April 15, 2009. Montreal Agglomeration Council June 18, 2009. Mayor of Montreal West: Campbell Stuart. comments for Meadowbrook golf course. Montreal Agglomeration Council August 27th, 2009. AMT and safety at Mount Royal tunnel. cultural resources, and managed through legal or other effective means ". ensure the protection and maintenance of biological diversity and of related natural and cultural resources". Why Are Protected Areas Important? The Green Coalition advocating the ecological archipelago park of Montreal. Le Parc Écologique de lÂ’Archipel de Montréal -- Tommy Monpetit en parle! Le Parti Québécois réitère son objectif à l’effet de protéger 12 % du territoire naturel du Québec, notamment dans la zone méridionale du Québec. Cette zone, d’une très grande biodiversité, s’étend des contreforts des Laurentides jusqu’aux frontières américaines et de Sorel à l’Outaouais. Bien que représentant un formidable défi, sa sauvegarde est d’autant plus importante que cette zone est habitée par une population très dense. À l’heure actuelle, seulement 4 % de cette zone est protégée. La protection de cette zone assurera pour les générations présente et future l’accès à des espaces naturels extrêmement riches en faune et en flore et permettra aussi de relier ces zones protégées au riche corridor appalachien.C’est aussi dans cet esprit qu’un gouvernement du Parti Québécois réintégrera intégralement les terres exclues du parc du Mont-Orford à la faveur de la loi 23 dans les limites du parc, ce que le gouvernement Charest, pour des raisons obscures, refuse de faire. On se souviendra que le gouvernement Charest avait exclu ces terres en vue de les privatiser, malgré l’opposition très majoritaire de la population.De la même façon, un gouvernement du Parti Québécois visera à protéger 12 % des espaces nordiques. Contrairement au gouvernement actuel, un gouvernement du Parti Québécois entend tout mettre en œuvre pour que soient associées, dès les premières étapes de la mise en œuvre de cette orientation, les nations et les communautés locales concernées. Il n’est pas question d’intervenir comme si la Paix des Braves et la Convention de la Baie James n’avaient jamais existées, comme le fait présentement le gouvernement Charest. Un gouvernement du Parti Québécois proposera aussi à ces communautés de participer à l’identification des zones réservées aux activités écotouristiques et les associera intimement au développement de cette filière d’écotourisme. Montreal West resolutuion in support of the creation of The Montreal Archipelago Ecological ParkLettre M. Patrick Beauchesne 2008/08/26réponse à tous les demandes d'appui au parclettre-échantillon demande d'appui au Parc Écologique de l'Archipel de MontréalTime to protect the 'green lace doily' of Montreal, environmentalists sayUn article tiré du magazine Green Living Canada, édition de l'automne 2008. Notre héros, Tommy Montpetit est une véritable source d'inspiration pour nous tous! to view aerial photos of the 10 ecoterritories. View street map for Montreal.